We have programs for every aspect of the executive and corporate arena. KPMG and the Bird Golf Academy teamed up at the Whirlwind Golf Club at Wild Horse Pass Resort and Spa on Friday, May 14th 2010. Attendees had the unique opportunity to work with a Tour de Force of expertise, including Director of Instruction and Bird Golf Founder Jay Ewing; West Coast Director of Instruction for Bird Golf, Jim Samsing; and National Head Professional for Bird Golf and LPGA Teacher of the Year, Sharon Miller. Participants were able to work on their swings, form and specific requests. Custom design a corporate golf outing with Bird Golf Academy and select options that meet your groups’ needs and your budget. Select the length of the program (1-5 days) and we will work with you in designing a curriculum for each day that your group will be sure to remember! The Bird Golf Schools executive golf programs are hosted at our flagship site, The Wild Horse Pass & Golf Club just outside of Phoenix, Arizona, at our fabulous site on Jekyll Island, Georgia and the Mission Inn Golf and Tennis Resort near Orlando Florida. Select any number of group clinics, anywhere from 1-4 hours in length. 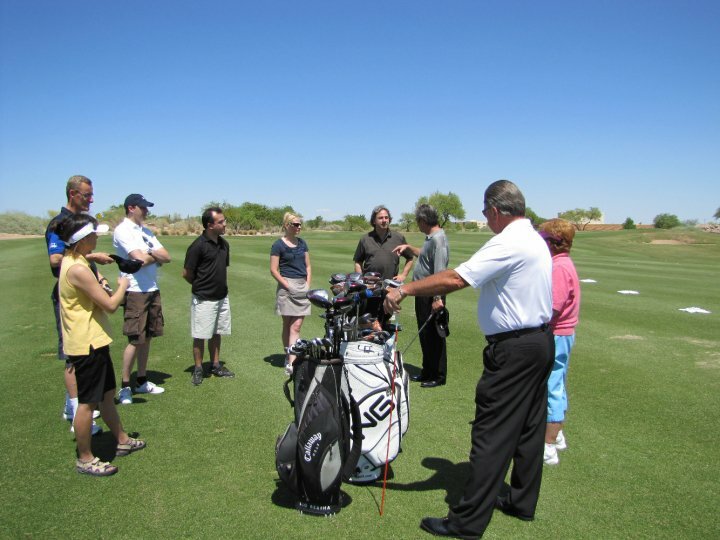 Depending on the size of your group we can arrange to have each person work personally with our PGA and LPGA professionals. With larger groups we can break people up into smaller sets and assign a professional to each set. Our professionals have an impressive list of playing and teaching credentials such as a US Open Winner, Founder of Golf for Women Magazine, PGA Master Professional, and 1989 LPGA Teacher of the Year and the founder of Bird Golf Academy. Take what you’ve learned on the driving range and practice areas and become skilled at applying that on the golf course (where it matters most)! Presented by Carey Mumford, the original golf sports psychologist. This seminar is a great team building event. Mumford has worked with numerous executive and management teams over the years with personality profiling. He will perform personality profiles for each person, determine their learning styles and he will discuss how this applies to business, daily life and how it applies to the golf course. Each person will receive individual records analyzing their golf swing. This take home record will assist each player in maintaining what they learned from instruction. We would be more than happy to set up a tournament for your group that would introduce all levels of players to competitive golf but keeping it fun too. Bird Golf version of The Big Break. Competitions available for groups anywhere from 5 to 20 people (1 and 2 person teams) compete in a series of different golf skills tests with each skill eliminating 1 team. We can fly a Bird Golf PGA or LPGA professional to you. If you are looking to host an event to cater to a more intimate group of clients, vendors or employees we can arrange to have a Bird Golf Professional come to your locations. Packages can be customized to fit any corporate aim. A Bird Golf ONE-on-ONE Eagle Golf School is the perfect way to reward your top performers and makes a great incentive for your sales team.